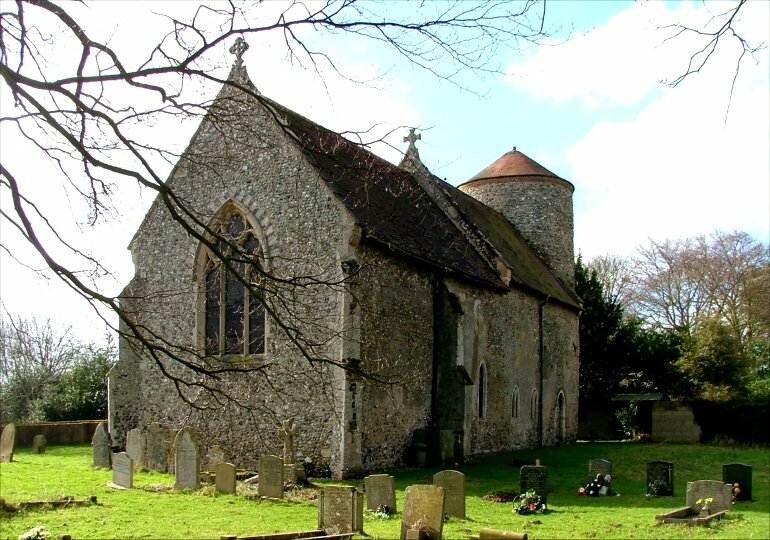 This is a delightful setting, the church set among a group of old houses, at a meeting of narrow lanes through fields that are starting to roll and fold as Norfolk spreads westwards away from the marshes and the rivers. 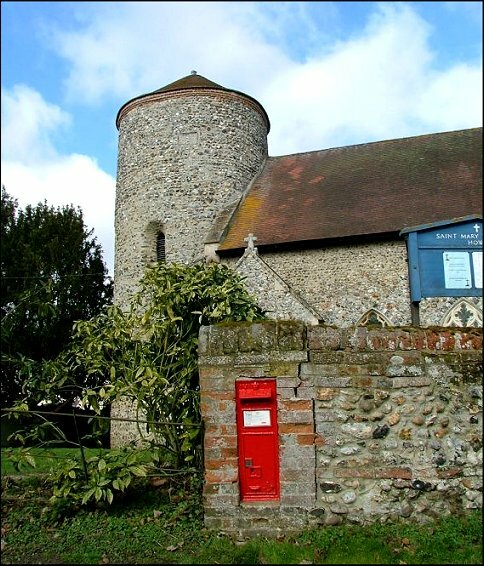 An old postbox set in the wall of the graveyard completes the scene. 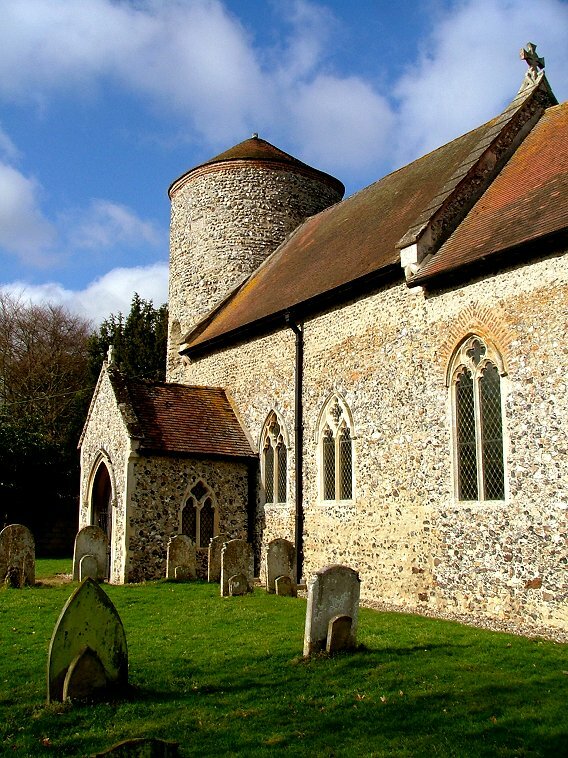 The round tower is unmistakeably Saxon, with its round windows and coursing with darker stone. There is a little conical cap, presumably the work of the 17th or 18th century, a bit like the one across the county at Little Snoring. 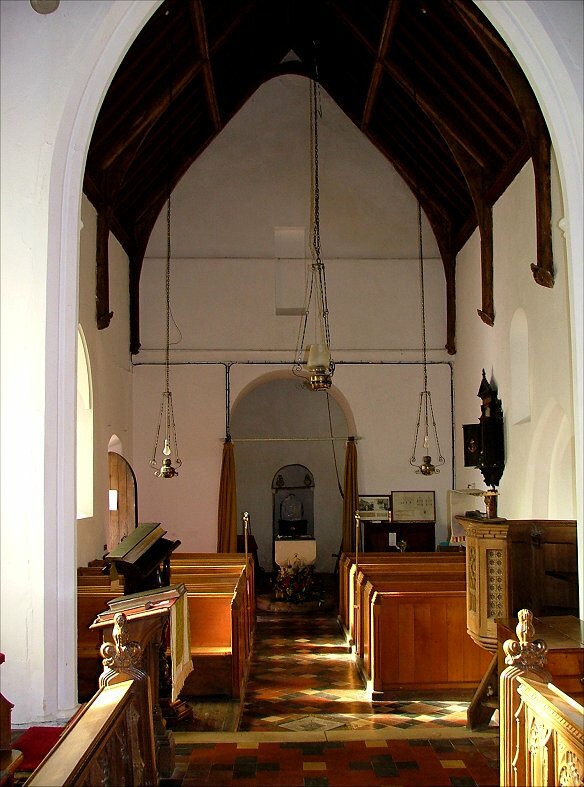 The windows of the nave and chancel are mostly in the Decorated style, but I think that they are all Victorian replacements; indeed, at least one seems to be set in the ghost of a once much larger window, probably Perpendicular. Even then, there is little to disguise that this was once a typical, homely Norman church, on the site of one which was even older. 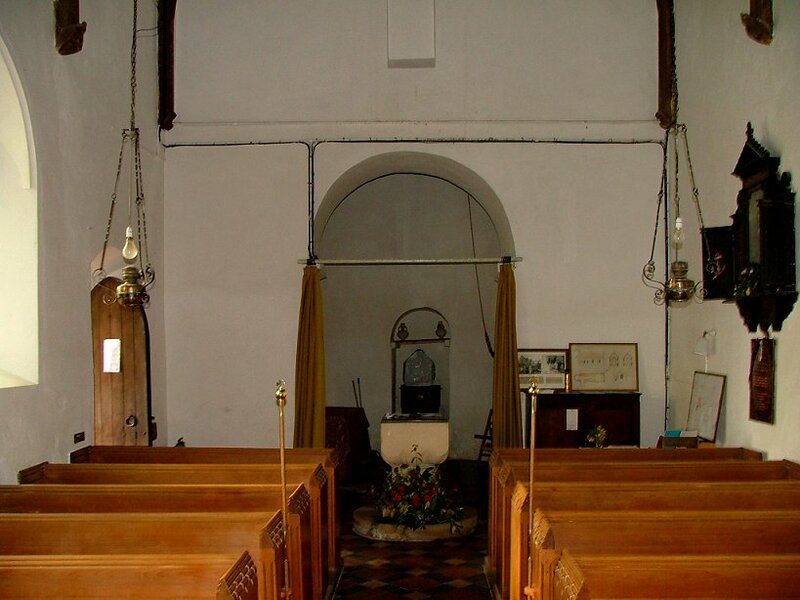 Despite its rustic setting, St Mary has the misfortune to have been drawn into the Poringland group of Parishes, all of which keep their churches locked without keyholders. 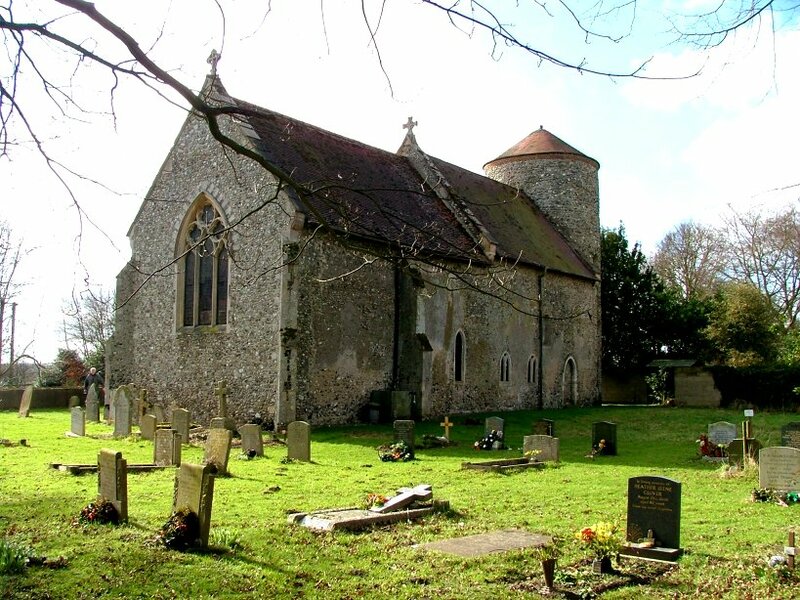 This is a crying shame, and a great anomaly in this part of Norfolk where the huge majority of churches have open doors everyday, including most of Howe's similarly remote neighbours. 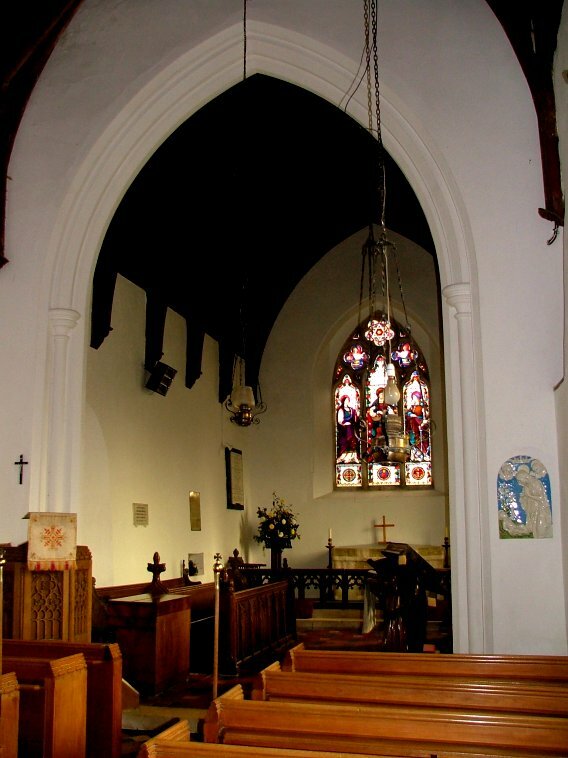 However, there are ways and means, and so we were able to step into the clean, tidy interior of St Mary. 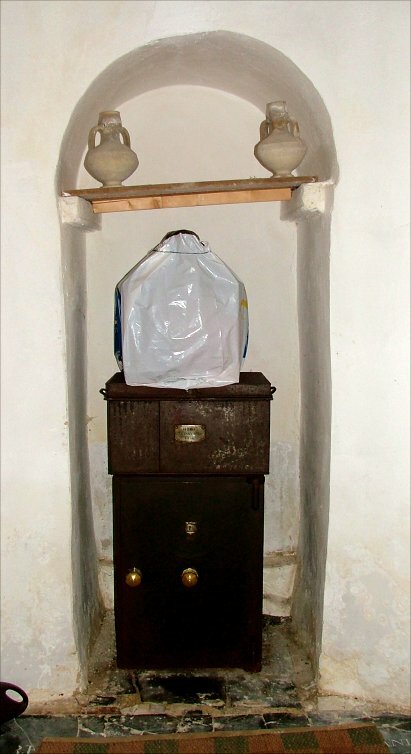 The most striking thing at first site is the primitive tower arch, echoed by an even earlier blocked doorway, now an alcove, on the western side of the tower. 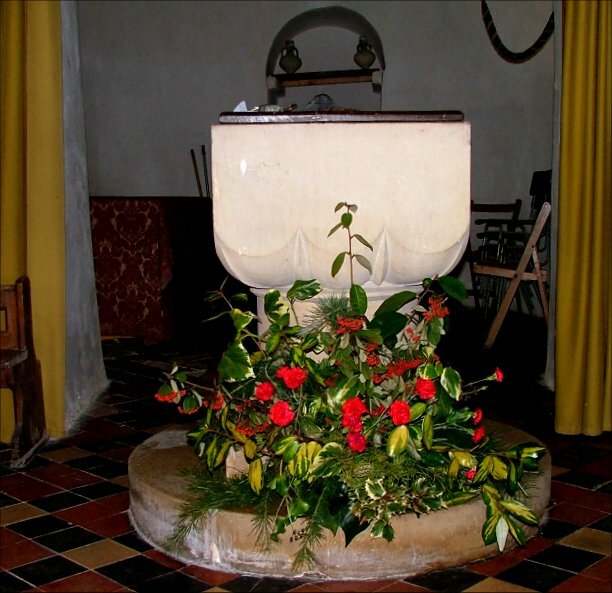 The 19th century font in front of the tower arch is fashioned in a Norman style, but pretty much everything here, in common with many of the churches round about, is unashamedly Victorian or later. 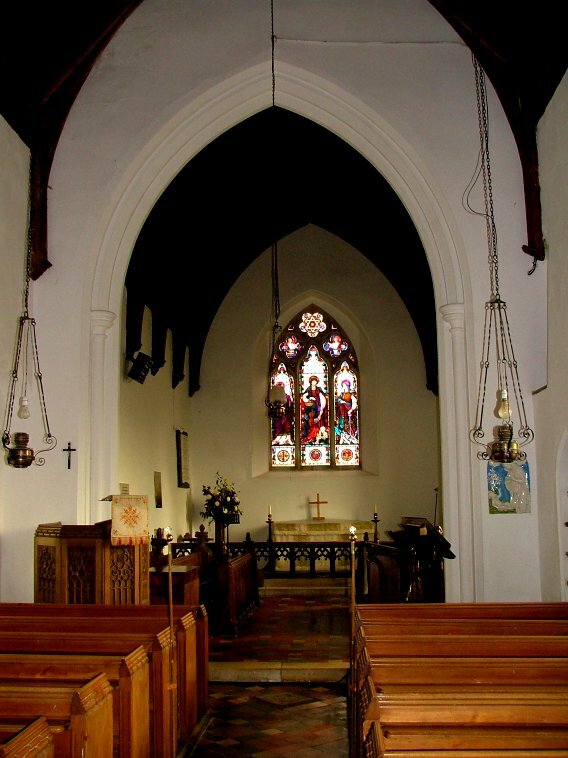 Sometimes these churches can be charming, or have a air of local character. But here at Howe I thought there was a slightly weary anonymity, a sense of communal life which is lacking here. 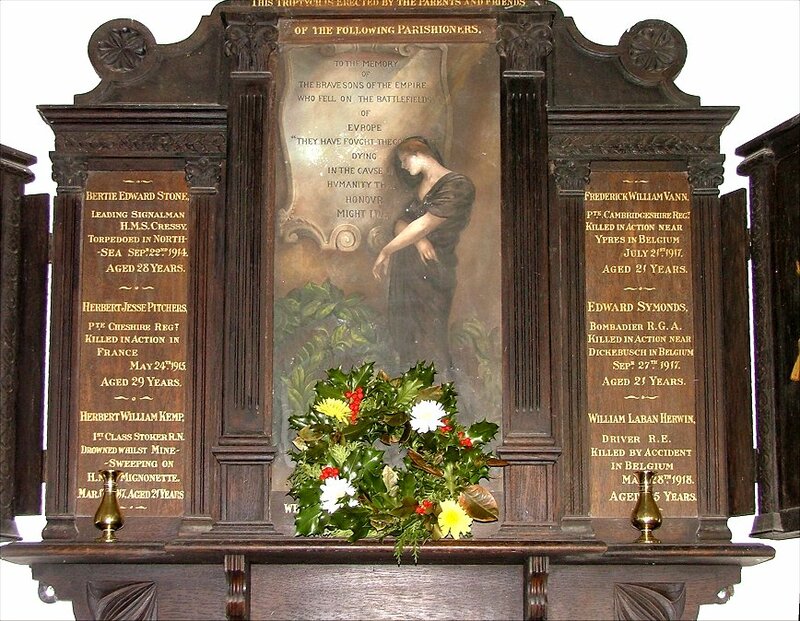 St Mary has one of the most elaborate war memorials in this part of Norfolk, which I immediately recognised from seeing similar ones in French churches. I wondered if it had been bought from a French supplier, because this kind of overtly lush sentimentalism is relatively rare in England. 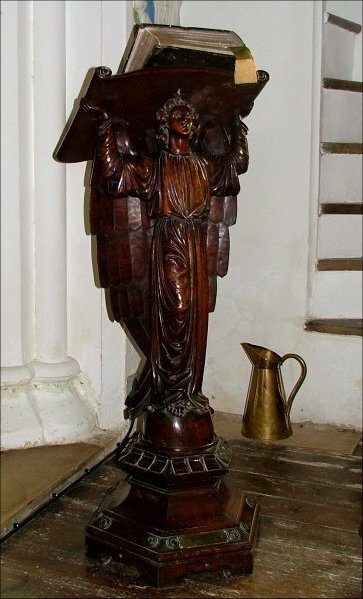 It is in dark wood with enamelled panels in the Gothic style like a Flemish altarpiece. 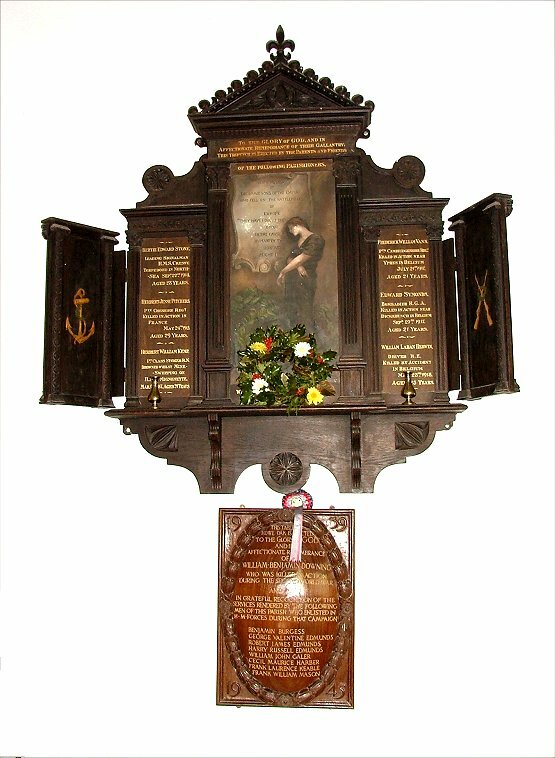 The memorial opens as a triptych, a grieving woman resting her head against a shield at the centre which reads To the Memory of the Brave Sons of the Empire who Fell on the Battlefields of Europe. "They Have Fought the Good Fight", Dying in the Cause of Humanity that Honour might Live. Interestingly, the circumstances of the death of all six named on the monument is included as well as the dates and their ages. An enamelled medallion below updates the list with those killed in the second great conflict of the century. Another touch in the French style is the beautiful lectern, an angel poised and balancing the reading desk. 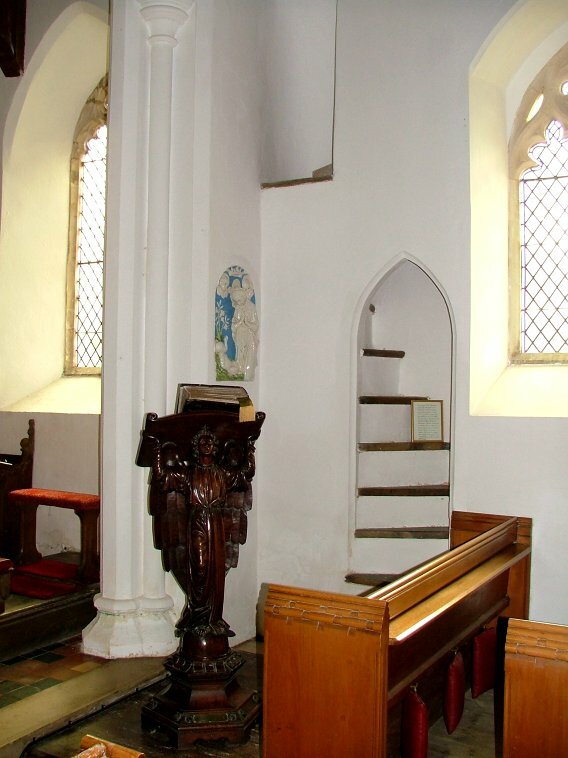 Behind it, the stairway to the rood loft climbs through the wall space, and their is a pretty glazed image of the Blessed Virgin and Child. 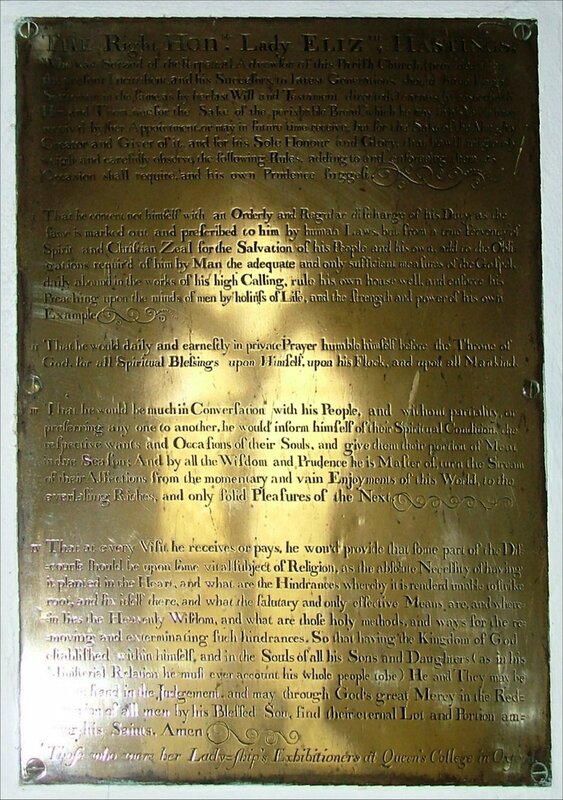 Perhaps the greatest curiosity about Howe is the brass plaque on the wall of the chancel. 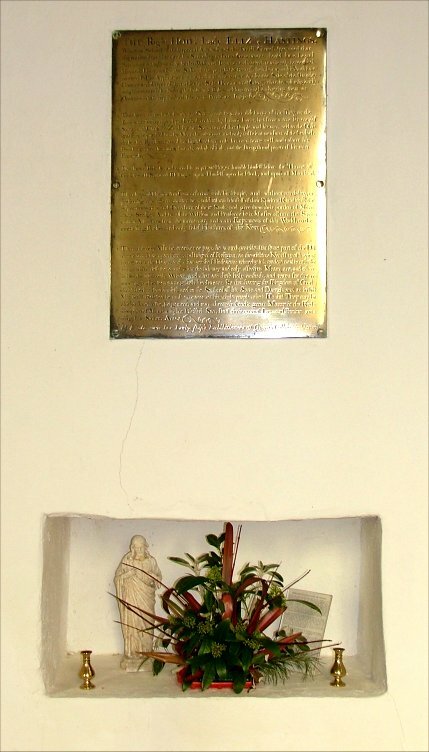 At first, it appears as if it might be a memorial, but in fact it records the instructions of Lady Elizabeth Hastings, the patron of the living, to any Rector that she chose for this church. It makes interesting reading, and so I have included a large format image of it that you can access from the thumbnail on the right. There is a sadness to the interior of Howe. Perhaps it comes from the war memorial, or perhaps simply from the church being locked away from pilgrims who might fill it with prayer. 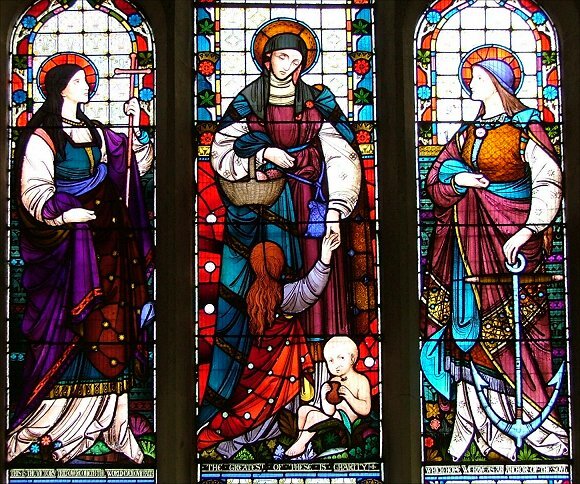 Whatever, it seems to have rubbed off on the faces of Faith, Hope and Charity, who look very glum indeed in the east window. So does the figure in a window on the north side of the chancel: God Be Merciful To Me, A Sinner, it reads beneath him. How miserable he looks! In this silent space, I contemplated him, and became conscious of the sound of my own breathing.